Here is my recipe for snickerdoodle cookies with my secret ingredient, vanilla pudding mix! I use an easy homemade pudding mix; 1/2 cup sugar, 3 tablespoon cornstarch and 1 teaspoon vanilla extract but you can use a store bought 3.4 ounce box of cook and serve pudding mix if you don’t have cornstarch or don’t want to make it. The pudding mix makes cookies wonderfully soft and chewy. They also hold their shape better and make much prettier cookies, in my opinion. My husband said these are the best snickerdoodle cookies he has ever tried and when I make a batch they do not last long! Perfect cinnamon-sugar cookies! Soft cookies and chewy centers! In a medium bowl, mix together the flour, baking soda, xanthan gum, cream of tartar, and salt. In a large bowl cream the butter and sugar together. Add vanilla pudding mix, eggs and vanilla. Mix well. Add the flour mixture to the creamed mixture. Mix well. In a shallow bowl, combine the cinnamon and the 1/3 cup of granulated sugar. Form the dough into balls (each equal to about 1 level tablespoon). Roll the balls in the cinnamon sugar mixture. Drop balls of cookie batter onto baking sheets about 2 inches apart. Homemade vanilla pudding mix: 1/2 cup sugar, 3 tablespoon cornstarch and 1 teaspoon vanilla extract. If the dough is soft place it in the frigde for 15-20 minutes. What a great recipe! I love snickerdoodles and this is great. 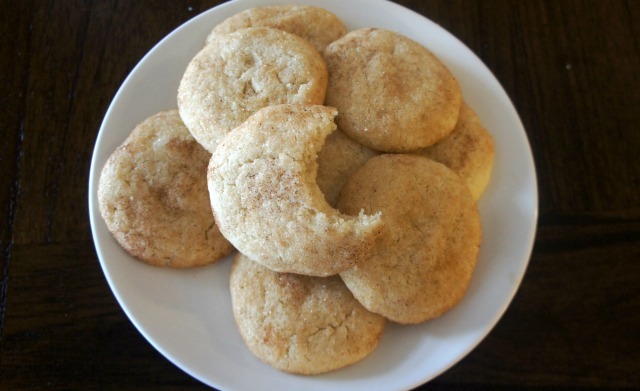 I love Snickerdoodle Cookies and think that these cookies look delicious, and I am going to make them! I like that they are gluten free. Oooh these sound AMAZING!! I love snickerdoodles!! They are my absolute fav!! Cool a gluten free cookie I love Snickerdoodles and so does my granddaughters who have definite problems with gluten I have saved this to try when they come over next month. Step 2 lists cream of tartar but it’s not in the ingredients? Sorry Rebekah, yes on the cream of tarter, 2 tsp. Thanks for catching the mistake. Cream of tartar? Yes or no…? Yes Kym, I have updated recipe. Please let us know on the Cream of Tartar, and if it is a yes, how much?? Thank you! These sound heavenly but will hold off making until we have an answer on this item. T.L. I have updated the recipe. These cookies are heavenly! Is this instant or cooked type pudding mix? I love Snickerdoodles and have missed them. Can’t wait to try them. Hey Barb, I use a cooked type pudding mix. Before discovering how easy it was to make a homemade version (directions in the post and notes of recipe) I used Dr. Oetker Organic Pudding Mix. It was baking soda. Sorry! I hope they turned out good anyways. Let me know. Thanks so much. It does sound easy to make your own. Will give it a shot. If the GF flour blend I have already contains xanthan gum, should I leave out the 1 teaspoon addition? If your flour already has xanthan gum, you should be fine. If I use a flour like that I usually add half of what is called for, just to be safe. Snickerdoodles are such a classic, they remind my of my childhood! Wow, these look so yummy–I will have to try them soon! These sound good! I am just trying now some gluten free baking flour red mill, and I’m not gluten free, but like trying new things. I love the texture and flavor this mix has rice flour one of my favs. I bet I would love these cookies and want to try it! Snickerdoodles bring back such good childhood memories! I love that these are gluten free though! I have always loved these thanks for the recipe. I will try these snickerdooles. Gluten free is a real plus. I’ve been having all kind of issues and this may be one. I see this is an old post. But I found this on Pinterest a few weeks ago. And I took the recipe and ran with it. They turned out great. I really loved them so did my family who is not gluten free. I will continue to make these.